A chance for a 4 game split on the road, hell yeah I'll take it. Virgil Vasquez takes the hill for the Pirates and even though he has lost his last 4 starts, the Pirates only totaled 4 runs in those games. Last Tuesday he pitched well enough to win, 6 2-3 innings, 2 runs and no walks, the Bucs lost to the Brewers 2-0. 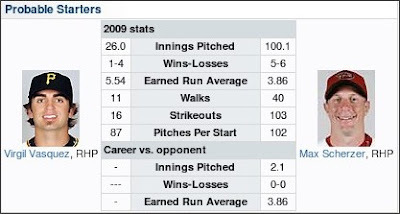 He does have an ERA over 11 on the road. Still, I'm hopeful. Game time is 4:10 and is on FSN. Go Bucs!